Entice your guests’ tastebuds with this Maple Herb Turkey this Thanksgiving dinner. 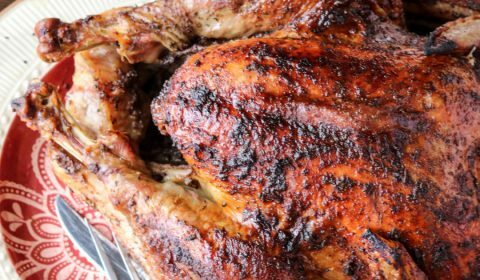 This year I wanted to test out a rub that brought in a compilation of flavors, bringing the turkey to life rather than just having a plain ol’ turkey with a little bit of seasoning. You all know how much I love my maple flavoring when it comes to balancing sweet and savory. I also considered the other dishes included in the meal plan to make sure all of the flavors would compliment each other well. And let’s not forget that these glorious flavors also transfer to the bone broth gravy! I mean, isn’t this a beautiful bird?? I didn’t want to cut it up it’s so dang pretty. And the flavors in that skin, oh my! 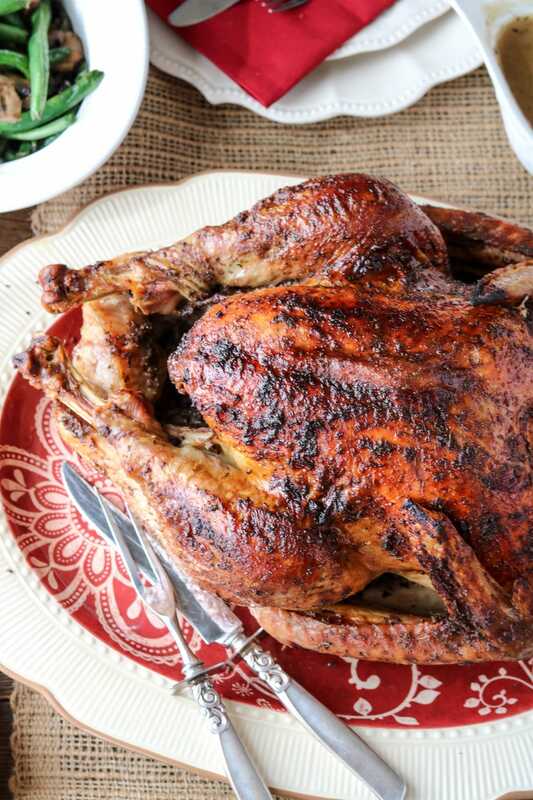 This Maple Herb Turkey is like the grand finale to a spectacular Thanksgiving meal plan. I am so excited to share this full meal plan with all of you. But let’s get back to this beautiful bird. With any turkey, you’ll want to make sure it’s completely thawed and cook according to the package directions. Be sure to have a meat thermometer so that you can check the internal temperature, I wouldn’t rely solely on the pop-up plug. I do not put my stuffing actually inside of the body cavity so you won’t find that step in this recipe. Be sure to also remove the giblet package from the body cavity before you start the seasoning process. You’ll combine all of the seasonings and begin rubbing them thoroughly all over the bird, including some in the body cavity as well. Then, during the baking process you’ll alternate basting between melted grass-fed butter and pure maple syrup. The end result is this beautiful, yet tasty, turkey! Preheat oven to the temperature recommended on the turkey packaging. Rinse completely thawed turkey, inside and out, and pat dry, inside and out. Place turkey in large roasting pan. Be sure that the turkey is sitting on a rack inside the roasting pan so that it is not directly sitting on the bottom of the pan. This will allow the juices to drip into the bottom of the pan for later use. Combine all dry seasonings in a small bowl, add in maple syrup and stir to combine. 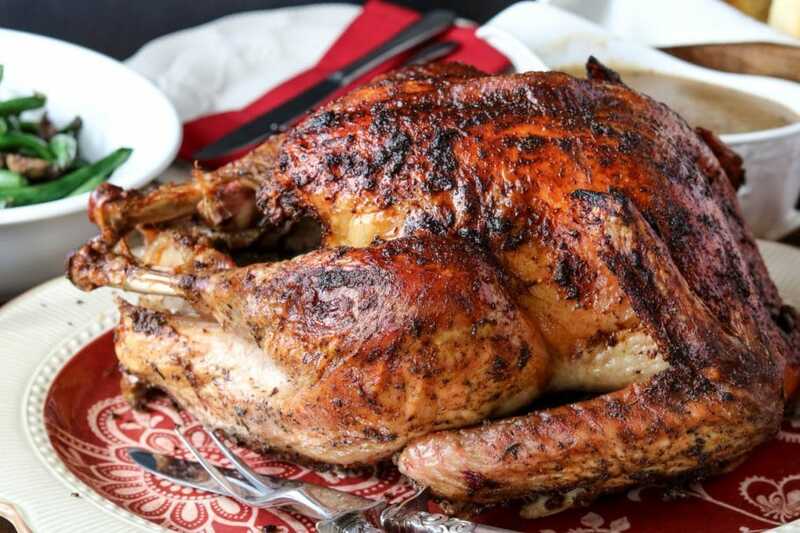 Using your hands, begin rubbing the spice rub thoroughly over the entire turkey, including the body cavity, until well coated. Place turkey in oven and set timer according to recommended cook time on the turkey packaging. Melt grass-fed butter, at the 1 hour mark, completely brush the entire turkey body with the melted butter. Place back into the oven. At the 2 hour mark, completely brush the entire turkey body with pure maple syrup. At the 3 hour mark, again brush the entire turkey body with melted butter. Let turkey finish cooking after that point. Near the end of the cooking time, place a meat thermometer in the breast (not touching any bones) and make sure the temperature is at the appropriate level. When done, remove from oven and let rest before slicing and serving. 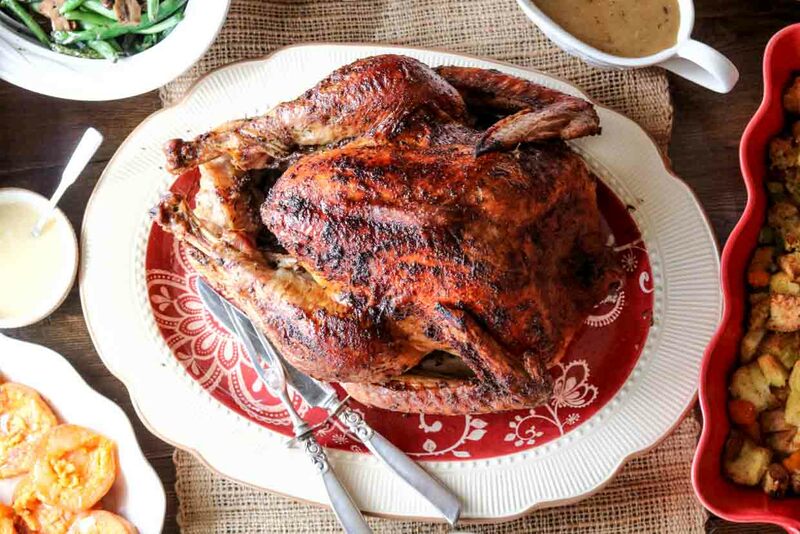 Reserve the turkey drippings and juices for the bone broth gravy.